This is one of my new favorite main dishes. 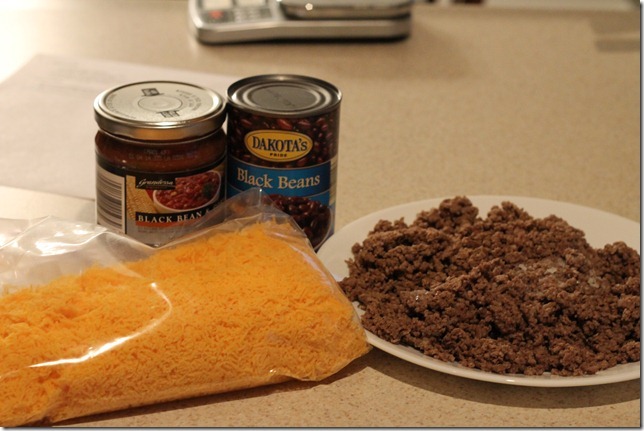 Since I keep fried up ground beef in 1 pound containers in the freezer, this recipe literally takes me about 6 minutes to put together! It only bakes for about 20 minutes, since everything is already cooked, so it can literally be on the table in less than 30 minutes! I think it would freeze well, but I honestly wouldn’t bother because it’s so quick to assemble. This is so good that I don’t even need extra cheese. It’s true. If he’s bypassing the extra cheese, you know it must be good! I’m just now picking my jaw up of the ground after hearing the words “don’t need cheese” come out of his mouth. All you do is throw that stuff together in the pan and stick it in the oven. The black bean and corn salsa really gives it a good and more unique flavor. Put all ingredients in a 13×9 pan and mix together. You can top with more cheese if desired (but be sure to add it into the nutrition info). Bake for 20-30 minutes or until everything is heated throughout and cheese is melty. 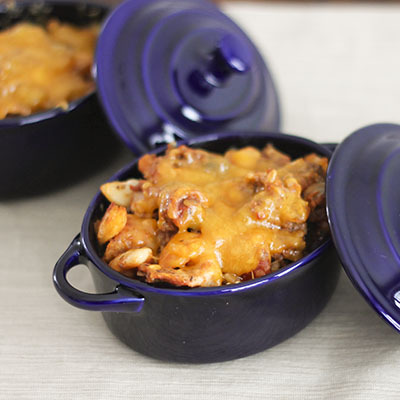 This is good with tortilla chips, as a filling for a tortilla, or all by itself. This post is linked to Tasty Tuesday, Living Well Wednesdays, and Works for Me Wednesday. There is a super yummy recipe for taco bake on my diet forum and I made it last week, freezing some. Yours looks easier though. I think I should try this recipe. Sorry the scales aren’t your friend right now, but hoping they will be before long. This is so versatile and looks so easy! Turkey burger, pinto beans, pepper jack cheese! You could even add sautéed onions and peppers. YUMMM!!! Wow, this does look good. Kristen has some great ideas too! You must be into Mexican lately. Keep up the hardwork. I don’t know if you remember Kyle making this comment in Bible Class a couple weeks ago, but he said “Running does not feel good, but when you keep your eye on the prize it motivates you to keep pushing through the pain.” I have found myself reciting that over and over and wondering when running will be easy, but I am beginning to realize that the actual running may never be easy, but the feelings of accomplishment and energy after I have finished always help me forget how painful the run was. You CAN do it! We’re all cheering you on! Looks so good, I think i found a new recipe to try on Sunday! This is SO my kind of recipe! I’m adding this to my list next wk! Love those little blue crocks! So cute! This looks delicious. I love how easy it is to put together. Do u brown meat first? Do u brown the beef first?